When your car is crashed see the Specialists at Sharp Image. Located in Rancho Cucamonga. We know your car is your baby and we take care of it like it was our own. We will deal with the insurance companies to ensure that your vehicle is restored to original condition. Don’t settle for less. Expect the best with Sharp Image – you’ll get it! 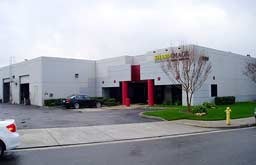 Sharp Image was established in 1998 and we have been responsible for providing outstanding auto body service ever since. 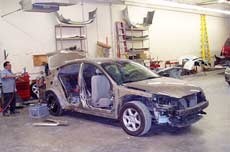 Our specialty is in the area collision repair. Our regular customers particularly value our advocacy on their behalf. At Sharp Image, we stand behind our work. Ask about our lifetime warranty. Our principals, Al and Hope Chille have been active in the communities of Ontario and Rancho Cucamonga since founding the business. Al has over 50 years experience in automotive repair. Hope was President of the Ontario Chamber of Commerce and chaired the Rancho Cucamonga Chamber morning networking group. We look forward to serving you! We restore your vehicle after a collision to factory-like condition. Don’t settle for mediocre collision restoration, choose Sharp Image. "We want to thank you again for the excellent work on our Honda. I appreciate so very much your careful reasonable billing & the time was of real benefit too. You are a credit to your profession & we wish you every success. " "I wanted to thank you once again for the beautiful work that was done on my wife's car. My wife and I both take extremely good care of our vehicles. Needless to say that after the car was rear-ended we were sure it would never be the same again. Thanks to you, we were wrong. Our car looks perfect. Perfect is a strong word that I use seldom. In this case I use it wholeheartedly. From the seams to the paint work, our car does look perfect. There are three things that stand out about you and your shop. 1. Your professionalism was outstanding. Every time I called or stopped by you always made me feel welcome and had no problem taking me into your shop to show me the progress of our car. 2. The time in which you fixed our car was unbelievable. When I was told it would be 2 weeks I thought for sure it would be more like 3 or 4 weeks. You had our car done in exactly 2 weeks and none of the quality was spared. 3. The quality of work done to our car by you and your crew was perfect. It is obvious that you and the employees in your shop take great pride in the work you do. Many companies today cut corners to make a higher profit. After seeing your work, I know you hold SHARP IMAGE to a higher standard, and my wife and I appreciate it. I hope that this letter will help you with potential customers. If they still need more proof of your quality work, than have them call me." "I hope that it isn't too late to thank you for the excellent service rendered by Sharp Image, and wish you both a happy and prosperous new year. Though quite early into this New Year, I would guess that Sharp Image has already grown its list of satisfied customers who have, like I, discovered the excellent service and genuine focus on quality and integrity that you offer. It seems to me that almost any repair service can provide acceptable work, but the professionalism, attention to detail, and working with the client to meet their particular needs are measures unique to Sharp Image. Please know that I appreciate all that went into getting my vehicle back on the road. The needed auto body work was terrific, and I also appreciated the many courtesies you extended: extra painting of trim, meeting with me on a non-working day to enable me to have my car back as early as possible, washing my car before pick-up, etc. I've thanked Kevin Lavelle of Rancho Autocare for pointing me in your direction, and I will do the same for family and friends who might need future auto collision repair." "Both my husband and Ed and I want to thank you so very much for being so professional and honest when I came in on Thursday. It is so hard finding honest people in business today and it's a joy to find someone like you! Thank you!" "I just want to thank you for doing such a beautiful repair job on my car. I am very pleased with your work and have already referred people to your center. You guys are wonderful! Thank you and have a great new year!" "To Sharp Image, Al Chille, and everyone that took the time and patience to help me fix my car. I am so pleased! My car looks beautiful! Thank you very much. May the Lord bless each & every one of you, and with your business." "Many thanks for all your help and your kindness. I very much appreciate your special care with my car and prompt work. I enjoy driving my car, thanks so very much. I will contact you if I need any work done in the future (Hopefully not too soon!)." "Thank you to all your staff for working so swiftly on my car. We had a much needed beach vacation. When I returned, the district had reconsidered and reimbursed my entire deductible. Pete and I will definitely be bringing more work your way. 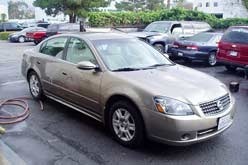 I appreciate your kindness and apparent care of me and my car." "Today I picked up my car and I'm absolutely thrilled because: -Everything you said you would do, you did and more; -You didn't take advantage of me, my being a woman, and not represented by a large insurance company; -My car was ready as you promised, and I'm not faced with bringing it back for something missed; -You treated me fairly and equitable in the cost, with hidden costs or add-ons, as I'm paying myself; -You were recommended to me by a friend an although a far distance from me, I'm delighted to say it was a pleasure;"